GPS for accurate synchronization and position measurement must use precise clock, so GPS satellites are equipped with atomic clocks. Clock accuracy is amazing ± 1 second in 1 million years. Using GPS module is available not only acquire position, speed, bet also time and date, so in this post I’ll explain how to do it. GPS clock consist of old Sirf II GPS module, MAX 232, Arduino Mega and LCD display (Hitachi HD44780). Sirf II module has RS-232 interface for communication and it can be connected to PC Com port. Atmega in Arduino board has UART interface. RS-232 basically is the same UART, only zeros and ones voltage levels are different. To match levels MAX232 driver is used. Today’s GPS modules have UART port, so there isn’t any need for MAX232. Arduino in this project doesn’t have clock function it just pass time and date from GPS module to display. It works that way because GPS module has internal RTC(Real time clock) it’s not accurate, but it is synchronized to GPS system. As you can see from video GPS module RTC is sychronised before GPS fix happens, but GPS fix is only one indicator that shows that clock is synchronised. 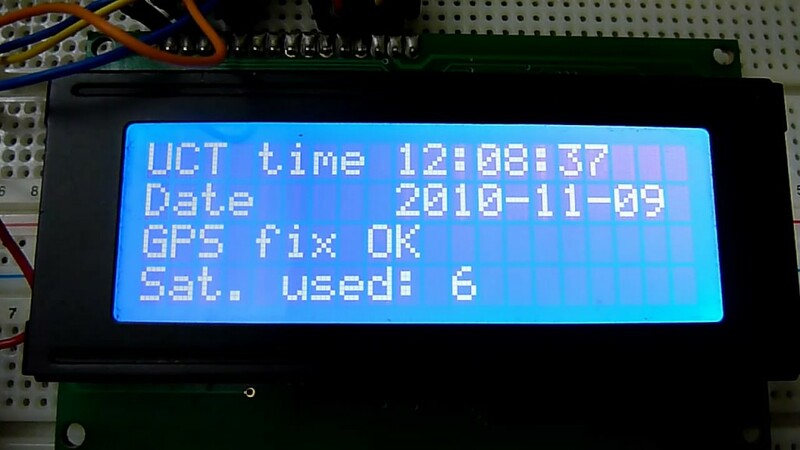 This entry was posted in Arduino and tagged Arduino, clock, GPS, GPS module, LCD, RS232, UART on November 14, 2010 by Darius.